A ball stably levitated on an invisible stream of air is a dramatic sight. Try to pull the ball out of the air stream—you can feel a force pulling it back in. You can also feel that the air stream is being deflected by the ball. This activity shows the force that gives airplanes lift. Note, though, that depending on the blower you choose, some experimentation may be necessary to find a satisfactory ball. You might want a partner to help you, or you can devise some sort of stand for the blower. That way, your hands will be free to experiment with the ball in the air stream. Blow a stream of air straight up. Carefully balance the ball above the air stream. Pull it slowly out of the flow. Notice that when only half the ball is out of the air stream, you can feel it being sucked back in. Let go of the ball and notice that it oscillates back and forth and then settles down near the center of the air stream. With one hand, pull the ball partially out of the air stream. With the other hand, dangle a piece of tissue paper and search for the air stream above the ball. Notice that the ball deflects the air stream outward. In the large version of this Snack, you can actually feel the deflected air stream hit your hand. 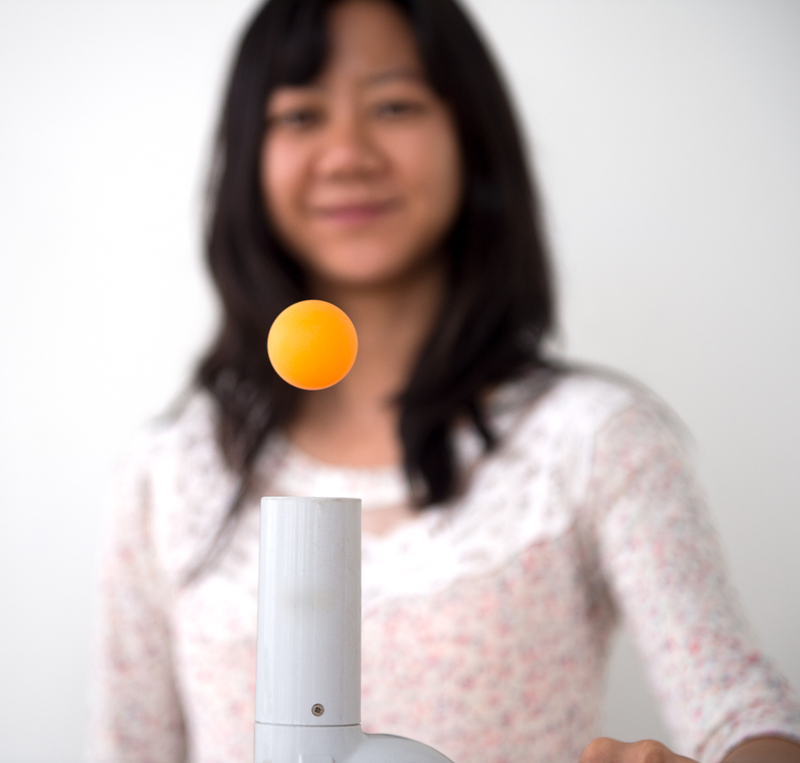 Tilt the air stream to one side and notice that the ball can still be suspended. 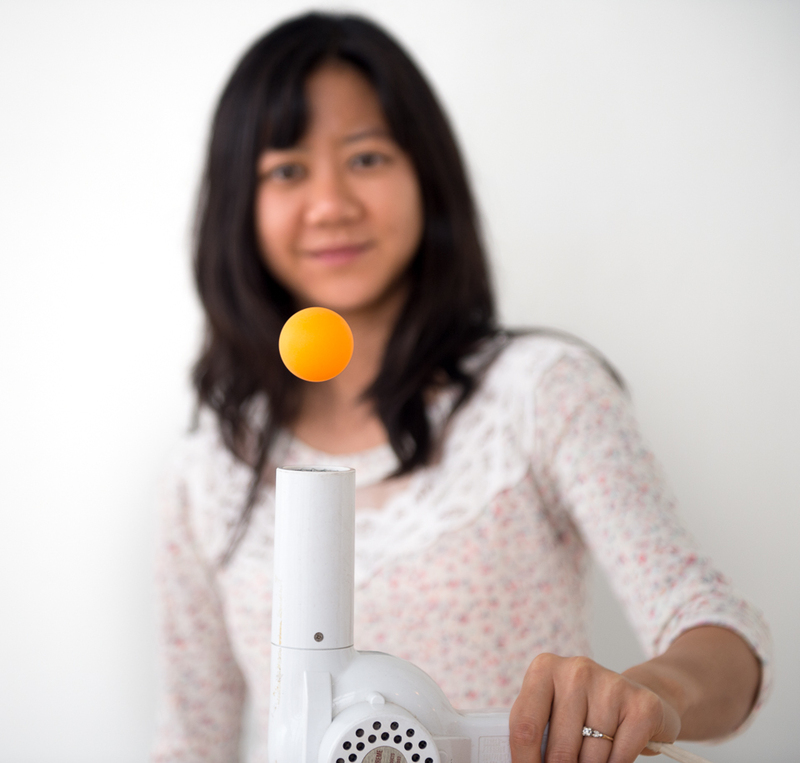 Balance the ball in the air stream and then move the blower and the ball toward a wall (try the corner of a room). Notice the great increase in the height of the suspended ball. When you pull the ball partially out of the air stream, the air flows around the curve of the ball that is nearest the center of the air stream. Air rushes in an arc around the top of the ball and then continues outward above the ball. This outward-flowing air exerts an inward force on the ball, just like the downward flow of air beneath a helicopter exerts an upward force on the blades of the helicopter. This explanation is based on Newton’s law of action and reaction. Another way of looking at this is that as the air arcs around the ball, the air pressure on the ball decreases, allowing the normal atmospheric pressure of the calm air on the other side of the ball to push the ball back into the air stream. People immediately raise several questions when they hear the second explanation: Why does air flowing over a surface in an arc exert less pressure on that surface? To answer this question, consider a rider on a roller-coaster car going over the top of a hill at high speed. The force the rider exerts on the seat decreases as the car goes over the top of the hill. In the same way, the air that arcs around the side of the ball exerts less force on the ball. Why does air follow the surface of the sphere? Consider what would happen if the air did not curve around the ball. An “air shadow” would be formed above the ball. This air shadow would be a region of low pressure. The air would then flow into the low-pressure air shadow. So the air flows around the ball. An alternative explanation is provided by the Bernoulli principle. If you pull the ball far enough out of the air stream, then the air flows over only one side of the ball. In fact, the air stream speeds up as it flows around the ball. This is because the middle of the ball sticks farther into the air stream than the top or bottom. Since the same amount of air must flow past all parts of the ball each second, it must flow faster where it is pinched together at the middle. The Bernoulli principle states that where air speeds up, its pressure drops. The difference in pressure between the still air and the moving air pushes the ball back into the center of the air stream. When you approach a wall with the balanced ball, the high-pressure region under the ball becomes a region of even higher pressure. The air that hits the bottom of the ball can no longer expand outward in the direction of the wall, so it drives the ball to a greater height. This activity illustrates one of the reasons why airplanes fly. A flat wing will fly if it is tipped into the wind, so that it forces air downward. Newton’s third law tells us that for every action there must be an equal and opposite reaction: The reaction to the downward force of the wing on the air is the upward force of the air on the wing. You can feel this lifting force if you hold your hand out the window of a moving car and tip your hand so that it forces the air downward. A wing that is curved on top will deflect air downward and produce lift even if it isn’t tipped. The explanation for this is essentially the same as the one given in this Snack. The wing collides with air, creating a region of high pressure in front of the wing. This high pressure produces drag, which is always associated with lift. The high-pressure air in front of the wing accelerates air over the curved surface of the wing. This air then flows downward behind the wing. Airplanes fly because their wings throw air downward. It is sometimes said that air must flow faster over the curved top surface of a wing than over the flat bottom. This is said to happen because the air has to meet up again at the far end of the wing, and since the air traveling over the curved path must travel farther, it must travel faster. This is not true. Two parcels of air that start together, then split to flow over different sides of a wing, do not, as a rule, rejoin at the far end of the wing.